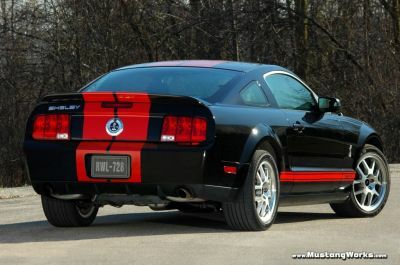 * Production of limited-edition Red Stripe Appearance Package for 2007 Shelby GT500 to begin in May. * Special package includes unique exterior striping and badges, Red and Black leather seating, special interior trim and logos and branded Shelby GT500 car cover. * 2007 Ford Shelby GT500 tops in segment quality, says RDA Group research—92 percent of owners would definitely recommend the vehicle to family or friends. Even with demand for the most muscular Mustang ever – the Ford Shelby GT500 – at a record high, Ford is cranking up additional interest with a new, limited-edition package that adds unique visual appeal to the Shelby GT500. Enter the "Red Stripe Appearance Package," to be available beginning in May. The Ford Shelby GT500 is the most powerful Mustang on the road today and arguably one of the most successful projects from Ford’s Special Vehicle Team (SVT) in terms of performance, excitement and, importantly, quality. In fact, early indicators show the Shelby GT500 is a quality standout. In the most recent Global Quality Research System (GQRS) study from RDA Group, an independent research company based in Bloomfield Hills, Mi., the Shelby GT500 earned praise as the highest-quality Mustang model, with the fewest “things gone wrong” in the first three months of ownership.